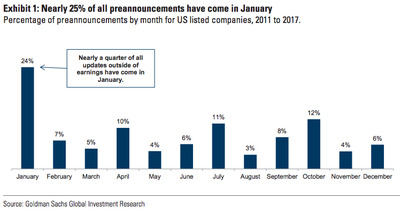 Goldman Sachs finds that January has historically been filled with stock price-moving events, and recommends investors position accordingly. Most of the fluctuations result from corporate guidance and preannouncements that take place leading up to fourth quarter earnings season. Stock traders would be best advised to avoid a holiday hangover, because there have historically been huge money-making opportunities in January, when fourth quarter earnings season kicks off. That’s according to Goldman Sachs, which also notes that the options market isn’t adequately priced for the stock fluctuations that are likely to come, despite the huge number of earnings preannouncements made during the first month of the year. After analysing 3,200 guidance updates since 2011, Goldman finds that 24% of them for the full year have come in January. And of those, 60% were from stocks in the healthcare and consumer discretionary sectors. The firm also says that price swings could be even more pronounced in 2018, in the wake of the recently passed GOP tax bill. That data informed a handful of recommendations made by Katherine Fogertey and the Goldman equity derivatives team in a recent client note, which can be found below. Goldman SachsJanuary has historically been full of earnings preannouncements. Healthcare conferences that take place throughout January – These events are a hotbed for healthcare companies talking about their forward guidance and performance during the prior quarter. Goldman specifically recommends buying Illumina straddles ahead of potential updates and management presentations. Retail holiday sales updates – A large number of retail companies either preannounce or discuss holiday sales trends during January. The firm specifically recommends buying GoPro puts, because the company’s sales are trending below expectations, and the stock could dip on any sort of update. The ICR Conference for retail and restaurants– This event has historically been a source of volatility for stocks in those industries. Goldman specifically recommends buying Jack in the Box straddles ahead of a January 9 investor presentation at the conference. Consumer Electronics Show (CES) – This four-day event features many tech and consumer discretionary companies, and can be a time of considerable single-stock volatility. GoPro management is set to present, reiterating the put-buying recommendation above. Detroit Auto Show – This six-day event draws attendance from all the major auto manufacturers and parts suppliers, and has historically been a source of price swings. Goldman notes that autonomous vehicles will be in focus in 2018. In conclusion, don’t sleep on the potential for major stock price shifts in January, because you could miss some serious chances to make a quick buck. After all, the unofficial start of earnings season comes January 17, when the market bellwether Alcoa reports.